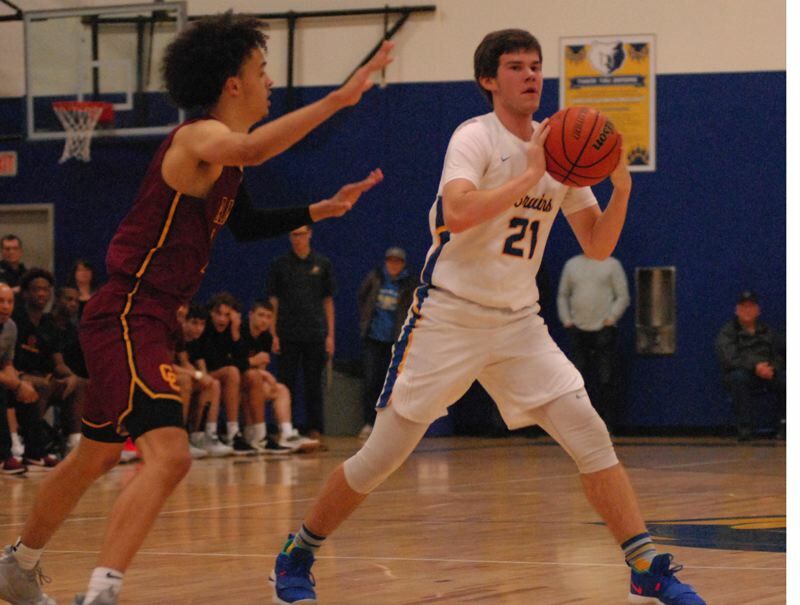 BARLOW 74, CLACKAMAS 59 — The Bruins broke open a close game by outscoring Clackamas 18-8 in the fourth quarter helped along with 3-pointers by Charles Ndayizeye, Dominic Jacoby and Jesse White. Evan Inglesby went 7 for 8 (.875) from the free-throw line, while White hit four shots in the first quarter on his way to a game-high 24 points. Jailen Hammer connected on a trio of 3s in the third quarter to bring the Cavaliers within four points heading into the final eight minutes. 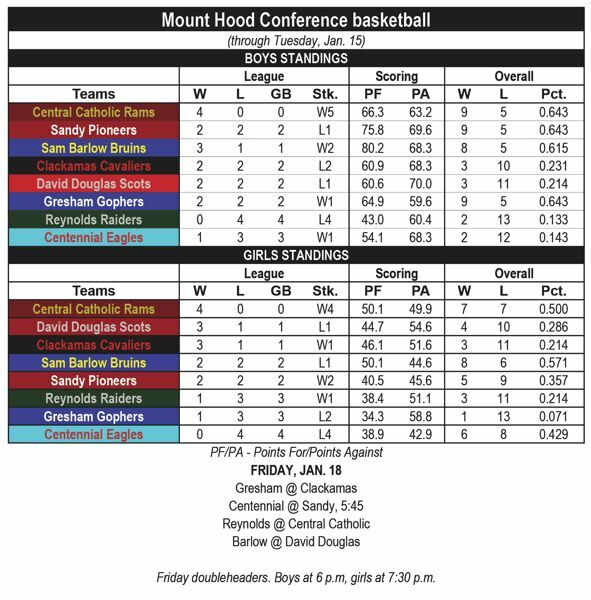 GRESHAM 78, SANDY 65 — The Gophers scored a key early-season win that could prove vital in the chase for the league's third guaranteed playoff spot at the end of the season. Gresham put up 10 points in two minutes to expand its lead to 21 points late in the third quarter. Daello Portin-Chapman powered the rally with a mix of jumpers on his way to a game-high 32 points. The Gophers sealed the victory by going 10-for-11 (.909) at the free-throw line in the fourth quarter. CENTENNIAL 53, REYNOLDS 47 — Reynolds rallied from a 10-point halftime deficit to make it a one-possession game, only to see Centennial's Nate Caro drill back-to-back 3-pointers to put the Eagles back in charge. He went 5-for-8 (.625) from behind the arc. Centennial secured the victory by knocking down 9-of-11 (.818) free throws in the fourth quarter. Keenan Coleman hit six second-half 3s to power the Raiders' charge back into the game. 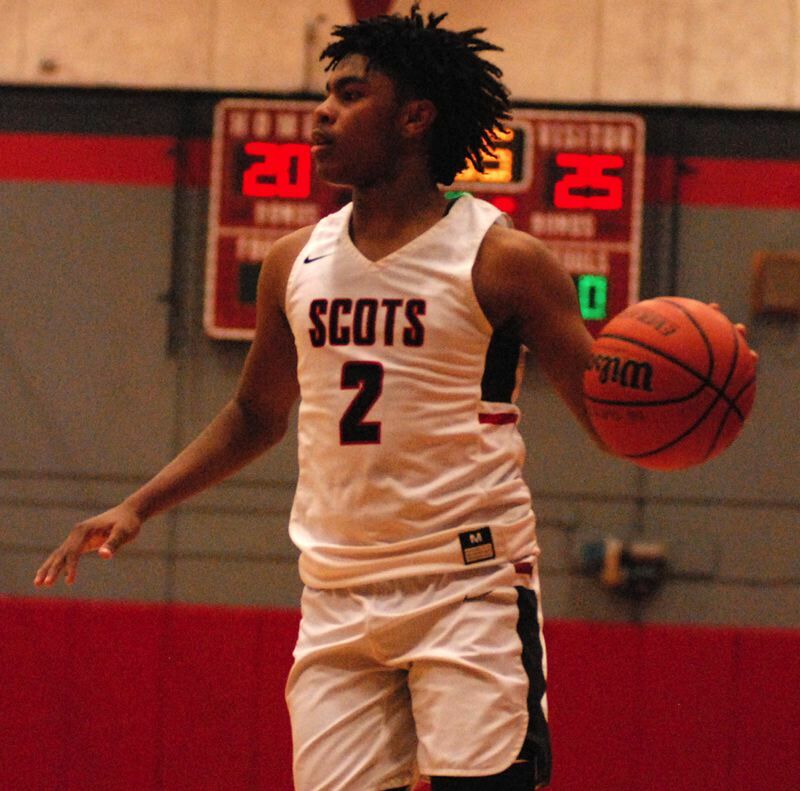 C. CATHOLIC 70, D. DOUGLAS 65 — The Scots battled back from down eight early and held a 55-54 lead with four minutes to play. Naatoli Tuffa hit a 3-pointer and was 4-for-4 at the free-throw line in the fourth quarter. Tyson Parker buried a long ball to bring the Rams back late, and SataieVior Ayilola hit six straight free throws down the stretch. Ayilola finished with a game-high 21 points, while Jermaine Robinson led David Douglas with 20. REYNOLDS 44, CENTENNIAL 41 — Centennial battled back from 14 down in the first half to take the lead with three minutes to go after Naomi DayChild and Trinity Miller combined to hit five 3-pointers in the fourth quarter. Reynolds answered with Christina Chernoff scoring the go-ahead bucket on a putback for two of her game-high 17 points. Kayley King went 5-for-6 (.833) at the free-throw line in the fourth to secure the Raiders' first league win. The Raiders got out to a 16-2 lead in the first quarter with Chernoff and Josephine Badoni knocking down 3s, while King hit on four straight free throws. 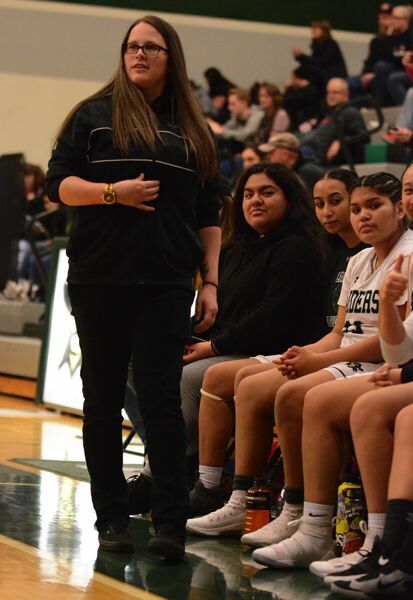 "Good defense turned into points and better shot selection," Reynolds coach Kelsey Stone said. Domonique Andrews led the Eagles with 15 points — nine of them coming in the third quarter. CLACKAMAS 65, BARLOW 55 — Barlow built a 26-23 halftime lead by feeding center Libby Mathis in the post. She put eight shots through the net in the two middle quarters alone. Mathis finished with a game-high 22 points, while Emory Miller scored 14. Clackamas stormed back with a 42-point second half, sparked by 3-pointers from Ava Peterson and Sydney Benedict. Kalani Hayes led the Cavs with 15 points, while Olivia Morris finished with 14. C. CATHOLIC 58, D. DOUGLAS 49 — Lydia Collins scored three first-quarter buckets to carry the Scots to an early 15-14 lead. Jenna Stradley hit a 3-pointer to keep David Douglas within a bucket at halftime before Central pulled away in the third quarter with Abby Cooper, Carly Hick and Maylon Montgomery all hitting long balls. Central went 16-for-24 (.667) on free throws, outscoring the Scots by seven at the free-throw line. SANDY 60, GRESHAM 26 — Sandy's defense limited the Gophers to two made baskets in the first half and took a 20-point lead into the locker room. Athena Thomas led the Pioneers with 16 points, while Bella Kansala added 15 points, hitting four of her five shots in the first quarter. Teammate Izzy Cabrera knocked down four 3-pointers. Jasia Mosley led the Gophers with nine points.